Former Premier League official Mark Clattenburg has suggested that he does not agree with the fact that Lee Probert awarded a goal kick instead of a corner in Everton’s clash with Watford. The Hornets won 1-0 on Saturday after referee Probert awarded a corner despite it not being evident that Toffees goalkeeper Jordan Pickford had touched the ball before it went out of play – and Clattenburg says that in situations such as this one, a goal kick should be awarded instead of a corner. “Everton’s Kurt Zouma was sent off for a second yellow card after the full-time whistle at Watford because of dissent. His gripe was clearly with the Watford winner, which came after Lee Probert awarded a corner even though it was unclear if goalkeeper Jordan Pickford had touched the ball,” he said in his Mail column. “Let us make one thing clear – if a referee has any doubt in cases such as this, then we are always educated to award a goal-kick. Why? If you give a goal-kick and it is later proven to be the incorrect call, everyone will soon forget about it because the consequences of the decision are likely to be minimal. “However, incorrectly award a corner and it leads to a goal, they will forever be showing replays and highlighting the mistake. 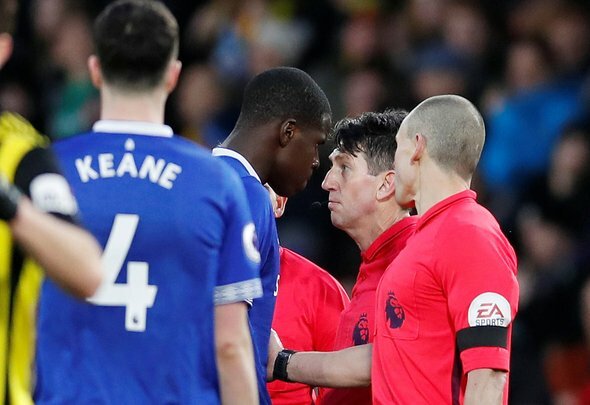 It is not often that a player is sent off after the final whistle, but in this instance, Zouma deserved to receive a second yellow after confronting the referee about a major incident within the game. However, it it is understandable why he reacted in such a way after hearing Clattenburg explain why a goal kick should have been awarded instead of a corner. Watford ended up scoring from their corner, something which you can argue was rather harsh on Everton. Zouma should not have reacted in the way that he did when he was already on a yellow, but many fans were no doubt up in arms about the whole situation. The Toffees may have got something from this game if the corner was not given, but as we all know, referees are sometimes prone to making mistakes such as these. Clattenburg is has hit the nail on the head here – the £40,000-a-week [Spotrac] player should not complain after being sent off, no matter how enraged he was.